This app is the iPad and iPhone version of the Vizy Video Conferencing system (for IOS software version 4.3 or later). The Vizy Conferencing system provides live personal or business video conferencing between iPhone, iPad and any Windows based computers. In addition to live video conferencing, it allows you to watch each other’s videos or see each other’s documents in real time. 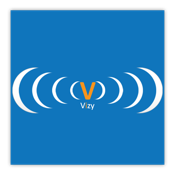 Vizy is ideal for business or personal use and is used as a secure Medical Tele-Consulting tool and as a mobile teleconferencing system between council departments and similar industries. Vizy Conferencing can connect portable systems, such as laptops, with most large hardware based tele-conference systems that meet recognised standard. This allows field based users to easily hold live conference calls with their office based counterparts and avoid wasted travel and parking costs. All Vizy Video Conference systems run perfectly on WiFi, hard wired systems and 3g of 4g systems. When coupled with Telehealth Networks™ Scheduling system (telehealthnetworks.com.au), which runs on windows or Apple based platforms, it provides an easy way to search a database of participating users for the person, specialty or department of your choice, view their calendars and create an appointment or connect immediately. For more information about the many uses of Vizy Teleconferencing, visit (vizy.com.au).